Kim Hollis: Everest was released into 545 premium and IMAX theaters this weekend in advance of its wide release a week from now. It earned $7.2 million, good for a $13,251 theater average. What do you think of this debut? Edwin Davies: It's a very interesting strategy that I fully expect to see more of in the future. IMAX-exclusive limited releases have been done before, but they've generally been for established franchise films like Mission: Impossible - Ghost Protocol, which earned $12.7 million from 425 IMAX screens back in 2011. For a film not based on an existing franchise to do so well by emphasizing its scale and the idea that you need to see it in IMAX suggests that this is a really good way to build excitement and buzz for a film that might otherwise not have an easy way of staking out its place in the market place. If its expansion turns out to be big next week, then I could easily see us getting at least five or six of these semi-platform releases next year. Ben Gruchow: I'm very impressed, considering that this one is IMAX DMR and not actually native IMAX (which is a mystifying whiff on opportunity, really; if you have a $55 million budget and you're shooting part of the movie on-location, why wouldn't you use IMAX for at least certain scenes?). If nothing else, it promises scope. I'm looking forward to the wide release of this one, and IMAX DMR is much better than no IMAX at all, especially with the scope of some of the images in the trailer. Kim Hollis: I think it’s a pretty solid performance and certainly sets the stage for this sort of platform release to become more common in the future. If the film were getting better reviews, I think it could have carried some word-of-mouth to its expansion. It’ll be interesting to see if The Walk behaves any differently, assuming that reviews and audience reaction are good. Ryan Kyle: I think the $13,251 per theater average counts this as a win as well as sets a good barometer for The Walk in two weekends from now, as it employs another IMAX-only strategy for a film that you wouldn't typically rush to see on IMAX. 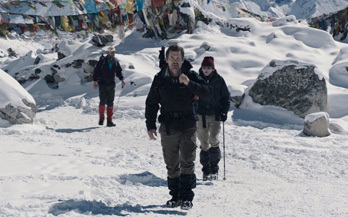 Next week's gross will really show well Everest will perform and how effective this exclusive one-week IMAX window truly is in building hype. With mediocre reviews and shot for a mid-range $55 million (funny how Black Mass ended up costing almost the same), this grandly-shot, non-franchise film seems like the perfect project to test this release pattern. Count this as another point to Universal's perfect report card so far this year.